Cigar smoking is an activity born of hundreds of years of practice and tradition. And like any other traditional pastime, smoking etiquette developed as ground rules to make enjoying cigars more comfortable for everyone. Some traditions, like dipping your cigar in cognac, have become irrelevant. Many old practices remain important. But times have also changed, making new smoking etiquettes necessary. Today, the smoking room is intruded on by more than just the occasional rude patron. We are now intruded upon by wall-mounted televisions, tablets, and smartphones. Social media has turned cigar bragging–once constrained to the lounge or private conversation–into a non-stop sport. For many a smoker, it is increasingly common to show up at a cigar lounge, sit down next to fellow cigar smokers, and spend the next hour in silence, checking email, posting cigar pictures to Instagram, or listening to music. All of this has served to turn many cigar lounge experiences–always understood to be essentially social in nature–into solitary moments in the midst of our fellow smokers. Obviously, the answer isn’t to ban all technology. But bearing in mind that cigar smoking has always been a social activity, here are three new etiquettes that will keep the heart of the activity intact. 1. Keep your smartphone, iPad, or computer put away for the first ten minutes after you light up. The first few minutes at a cigar lounge are the most pivotal to creating a social experience. Instead of checking your Facebook, greet each person in your immediate area, introducing yourself and shaking hands. You’ll find that seven times out of ten, your conversation will continue or start up again later during your visit. Our world is full of distractions pulling us away from relating to other people in the real world. If the television is on and no one is watching, what purpose does it serve besides shielding us from having to talk to those around us? Once the TV is off, the silence will create both a more relaxing environment (which is what cigars are all about) and naturally lead patrons into conversation with each other. We are more connected to our work than ever before. In the last hundred years, our market economy has focused our attention on work and encouraged us to judge ourselves and others by what we do, or worse, how much we make. And now with smartphones, leaving the office doesn’t disconnect us from our work the way it used to. When talking to a new friend at a lounge, remember that smoking is a leisure activity. The last thing most people want to talk about after work is work. Instead, talk about cigars, family, or the book you’re reading. Even politics is better than talking about work, because at least conversations about politics can, in the best circumstances, make us a friend and encourage us and help us be better citizens. Of course, not everyone wants to spend their time at a lounge talking to others. The important thing is not to ignore others completely. 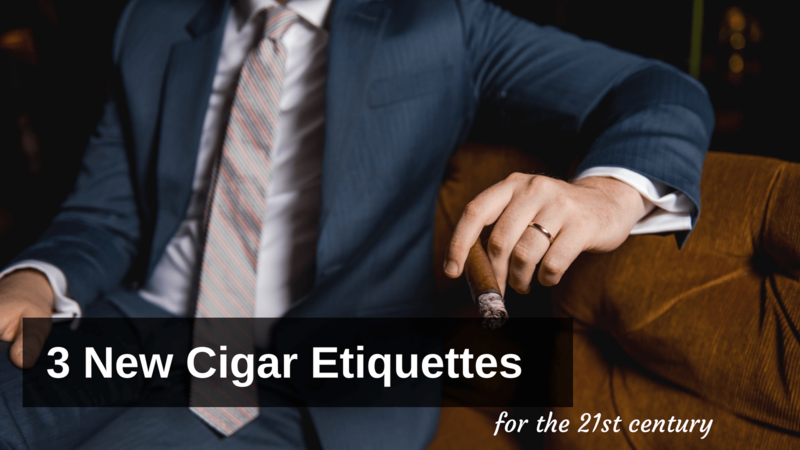 Do you have a cigar etiquette that you think belongs on this list? Or a smoking lounge pet-peeve that you find being played out over and over again? Drop it in the comments section!